So, there’s good news and bad news: the good news is that our drywall is up and tape and texture are in progress. Our home has actual walls and no longer resembles swiss cheese — hooray! But the bad news (at least for me) is that walls mean paint…which means commitment…to color…damn. 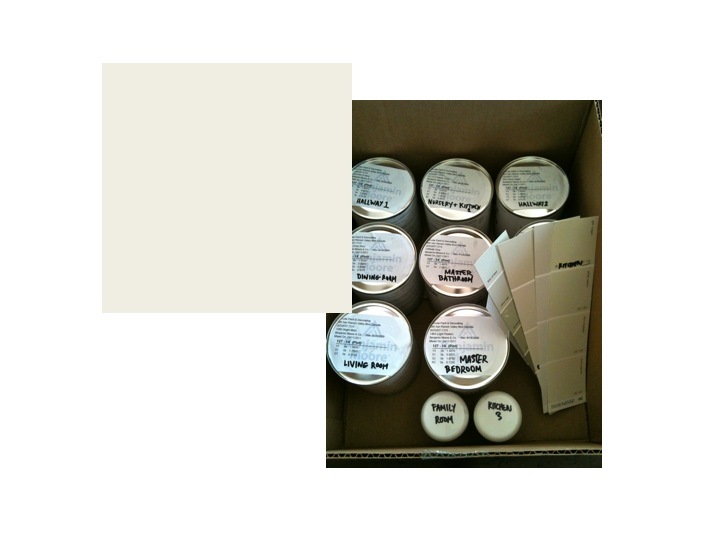 Indeed, D-Day has arrived for paint selection, and given my color-phobia and the fact that the hus-b has plumb run out of home-related opinions (the poor darling is spent), our decorator and dear friend, Lindsay, was called in as the paint color cavalry to rescue us from our indecision. Living Room. Remember our prior post about decorating around our beautiful navy and chartreuse Persian rug? We’d been waffling between a safe creamy hue and a daring (at least for us) gray-blue, and the unanimous winner was…Benjamin Moore “Night Mist”, a perfectly sophisticated pale gray-blue that perfectly bridges the gap between the foyer’s modern wallpaper and the living room’s traditional rug. Hall. Like so many San Francisco flats, our hallway could double as a regulation-length bowling lane. An updated lighting scheme (from a single sconce to three overhead recessed lights and two double library sconces) has gone a long way to improving the space, but a dose of color would further brighten this otherwise long, dark, personality-free hall. 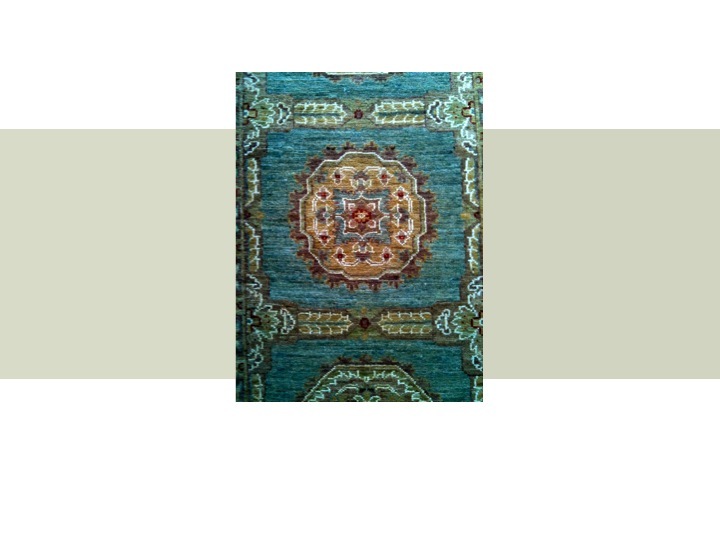 In an effort to coordinate with a gorgeous Persian rug runner (pictured above; also a lovely gift from my father- and stepmother-in-law), we settled on pale blue-green but are still waffling between Hint of Mint (above left) and Silver Sage (above right). The former name makes me crave ice cream and the latter name reminds me of the previously overdone Restoration Hardware hue. Help?! Dining Room. Sandwiched amongst a gray-blue living room, blue-green hall and dramatically wallpapered foyer, the dining room begs for some subtlety.  Lindsay suggested “Gray Mist” because it is a neutral with green undertones that relate to the paint color in the hall (which I don’t see *at all* given my low paint IQ), perfectly illustrating why we’re leaving these decisions to a professional. Nursery. YES, we are being the worst parents in the world by designing a nursery without a theme, “colors” or any other baby-ish tsotch. It’s just not our style, and (fingers crossed) it certainly won’t be our kid’s style either (the worst rebellion imaginable: Disney Princess bedding. Shudder.) 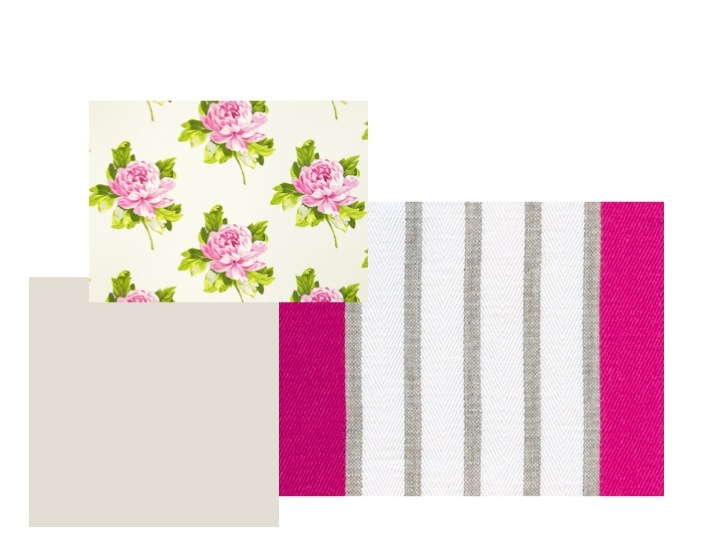 We’re going with “Classic Gray” on the walls and a to-be-determined pink (!) on the ceiling for a ladylike take on fun. Family Room. With its charming original built-ins and cozy lighting, this has been, hands-down, the most popular room in the house. While we are actually perfectly satisfied with the neutral tone presently on the walls, it seemed nuts to repaint the entire house save a single room. 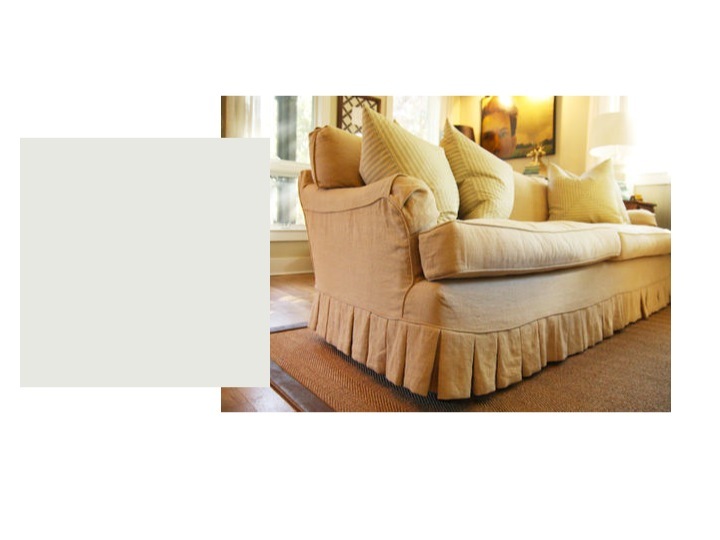 Given the ivory slipcovered Quatrine sofa (similar to the pleated number above) and the apple green and apricot accent pieces, Lindsay suggested “Pale Oak”, a cozy gray that is slightly warmer than the other paints we’re using without deviating from our palette. Kitchen. The least-changed room in the house during this remodel, our kitchen was already exceedingly bright and functional. Our one beef with the space? The heinous paint, which may have looked neutral in the can, but when paired with the pinkish-grey countertops takes on a decidedly peach-y color that hasn’t been chic since Gunne Sax dresses were the height of fashion. I am an absolute fool for white, gray and apple green kitchens, so we’re testing out wet samples of three colors: “Celery Salt” (a pale, Martha Stewart-y green), “Classic Gray” (the hus-b’s incredulous response: “The baby’s room and the kitchen can’t be the same color!”) and “Super White”, which looks exactly like it sounds and is the color Lindsay used in her own kitchen. Master Bedroom. Our existing bedding is — no surprises here — white, black and monogrammed. 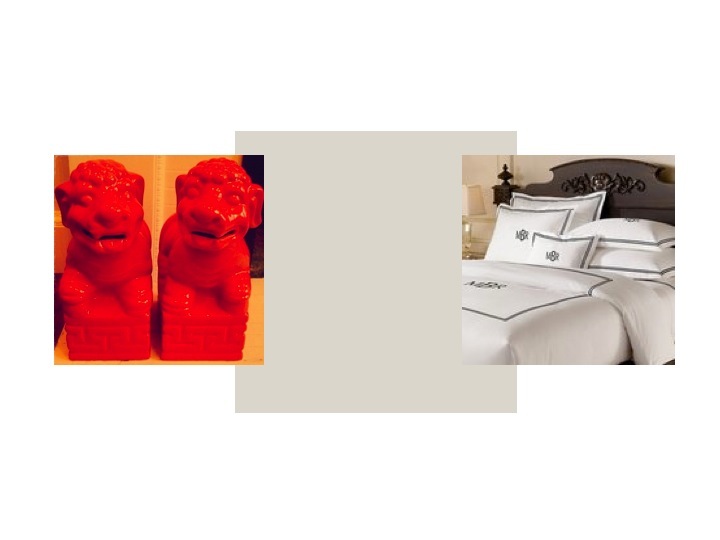 I’d prefer to incorporate color with art and other accent pieces (like my beloved orange Foo Dogs), so we’re keeping things neutral with “Light Pewter”, a sophisticated gray that is similar to the master bathroom paint color albeit slightly warmer for a cozier feel. Master Bathroom. 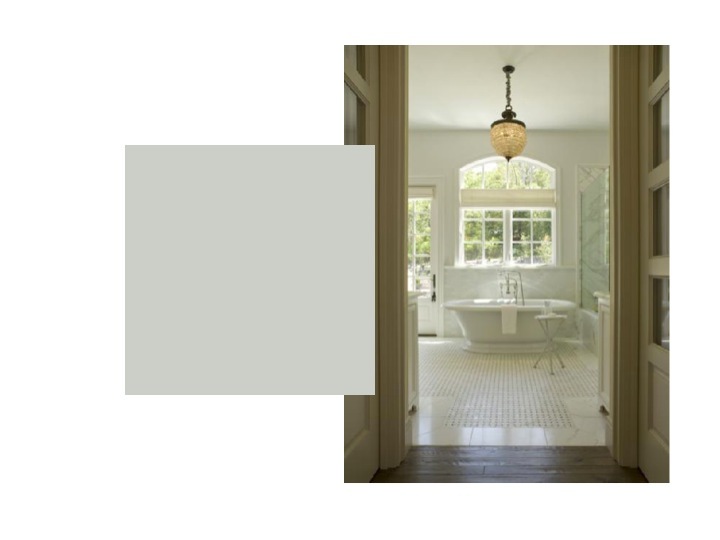 Given the significant amount of carrara marble we’re using in this bathroom, cool gray is the natural paint choice. My original master bath inspiration photo featured “Cliffside Gray” paint and we’re hoping to see similar results with it in our own bathroom! Ceilings, Moulding & Architectural Details. We are fortunate to be working with a great deal of original wood detailing as well as new crown moulding which will highlight our newly cove-less 10 foot ceilings. The existing color is a warm, yellow-y cream which I *loathe* and have been itching to replace since the day we moved in. In an effort to brighten the space and shift the palette in a cooler direction, I was prepared to go blindingly white but Lindsay nudged me in the direction of “White Dove”, which is brighter than the existing paint color without sacrificing elegance as bright, kitchen-y whites can tend to do. 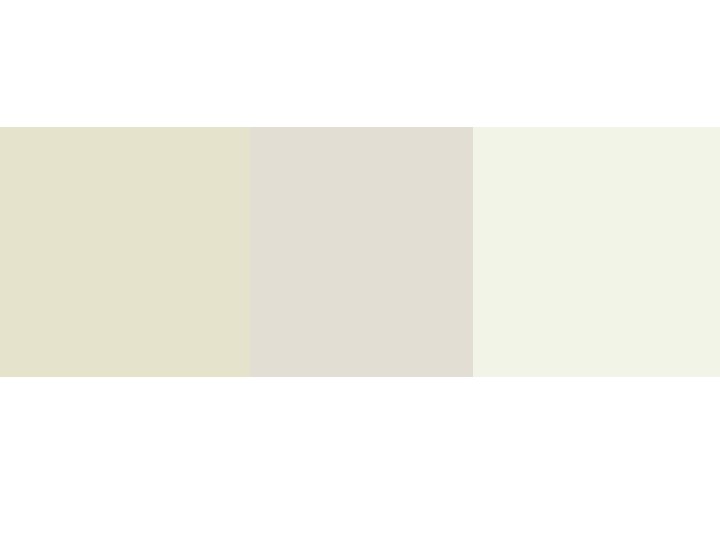 So, what do you think of our proposed paint palette? Drop us a line — we’d love to hear from you! 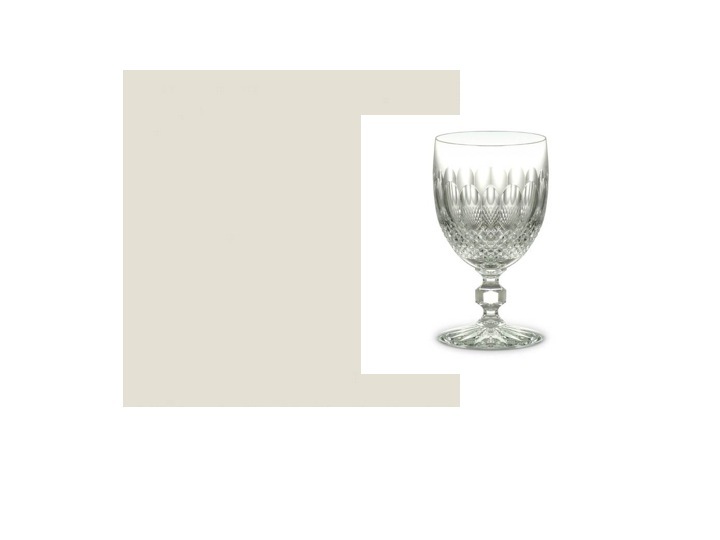 What did you decide between the hint of mint and silver sage? I am having the same dilemna at the moment and stressed as I have to pick today! Thanks for any help! Hi Stacie! We decided on the Hint of Mint and are oh-so-pleased with the choice. Our hallway doesn’t have much natural light, so the brightness of Hint of Mint really works in the space. If we had been dealing with a sunnier room, Silver Sage may have been a more appropriate choice. Best of luck! Okay, seriously, I can NOT see the difference between the blue-green, grey-blue, or other variations of tan. Sadly, I think this just means my paint IQ is even lower than yours. Apparently the California Bar Exam does not factor in paint IQ — bully for us! Hope all is well, Whitney, and that you are enjoying life as a newlywed!